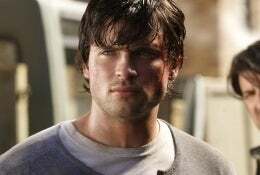 Smallville's Season Premiere Brings the Crazy and... The Enjoyable? If there's one thing that the season premiere of Smallville showed, it's that they don't lack for ambition. Acting talent, believable dialogue or any shred of plot that doesn't make you think that the writers went to the Roger Corman School of Writing, sure, but ambition? They've got that in spades. That's how we ended up a plot that brought together Russian terrorists, mind control serums and, of course, Lois Lane dressed up in a ridiculous outfit. Welcome back, Clark.Picking up from last season's cliffhanger, we get Clark and Lex missing and everyone looking for them - apart from Lois, who's looking for the equally missing Chloe by pretending to be a French Maid and dusting Lex's mansion. Is there any reason for this beyond the visual pleasure of Lois in a French Maid's outfit? Of course not, but reason has never been high on Smallville's agenda, something that's especially true in this episode that runs through plot so quickly that it makes Heroes look like the second season of Lost. In a way, you have to admire the way in which the show speeds through resolving all of the cliffhangers (Clark's trapped in a Russian work camp! Even though you never really learn how he got there! And then he's rescued by Green Arrow! Even though you never really learn how he found Clark! And then they rescue Chloe, who now has a magical supercomputer brain, and Clark dies before coming back to life with all his powers back! And then everyone moves to Metropolis!) and concentrates on setting up a new status quo as quickly as possible. The show may have some of the same problems as before - like, you know, appearing to have been plotted by a hyperactive five year old (Seriously, what was with the sudden appearance of mind control juice? And why did no-one seem that bothered about it afterwards?) - but there's something oddly refreshing about the way that the characters seem to suddenly be aware of the show's failings - Hello, new character Tess Mercer's snark about Lois liking to play dress-up, or Clark realizing that there's no reason for him to stay in Smallville anymore, and hasn't been for about a year now - and at least give the appearance of moving on. While I'm unconvinced that this year will necessarily get the creative bump that it needs - especially given the generic teaser for next week's episode, which looks like we're immediately right back to Freak of The Week plots - I'll admit that the last scene of Clark and Lois attempting some witty workplace banter felt a lot fresher than the show has for a couple of years. More of that and less of Chloe's weak The Matrix rip-off, and it might even be worth watching on a regular basis again.